I am the FACETs Coordinator and Liasion for NOAA's Global Systems Division (Boulder, CO) and the National Severe Storms Laboratory (Norman, OK). FACETs stands for Forecasting a Continuum of Environmental Threats. FACETS is a framework that allows for a shift from deterministic information for weather hazards to a more continuous, probabilistic flow of information. 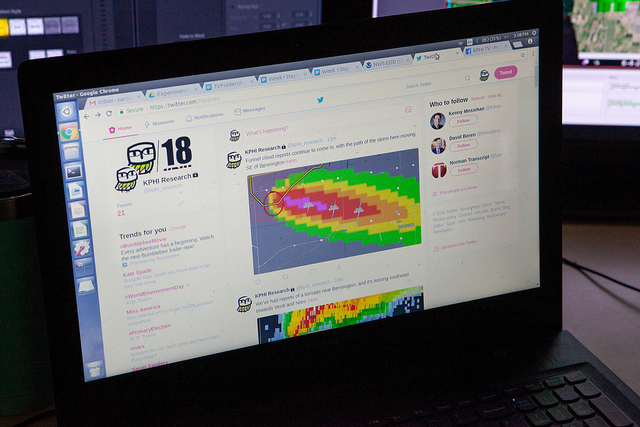 This hazardous weather forecasting concept is designed to communicate user-specific, understandable weather threat information. My research portfolio focuses on the development and transition of probabilistic watch and warning information, and how end-users will use this information to communicate and make decisions. I am integrating broadcast meteorologists into research and testing within NOAA's Hazardous Weather Tested, to learn how probabilistic hazard information can be optmized for effective communication. Before entering the world of research, I was an on-air broadcast meteorologist since 2008. I worked extensively in severe weather markets, including KLBK in Lubbock, TX and KETV in Omaha, NE. Obermeier, H., K. Nemunaitis-Berry, K. E. Klockow, C. D. Karstens, A. Gerard, and L. P.
Calhoun, K. M., T. C. Meyer, K. Berry, H. Obermeier, S. J. Sanders, C. A. Shivers, C. D.
Decision Support Services, Austin, TX, American Meteorological Society, 4.4. Meyer, T. C., K. Berry, M. A. Bowlan, K. M. Calhoun, J. Correia Jr., G. S. Garfield,A. Gerard, T.
Hansen, C. Karstens, K. Klockow, D. LaDue, J. G. LaDue, W. Line, C. Ling, D. M. Kingfield, K.
Transition of Research to Operations, Austin, TX, American Meteorological Society, 9.4. 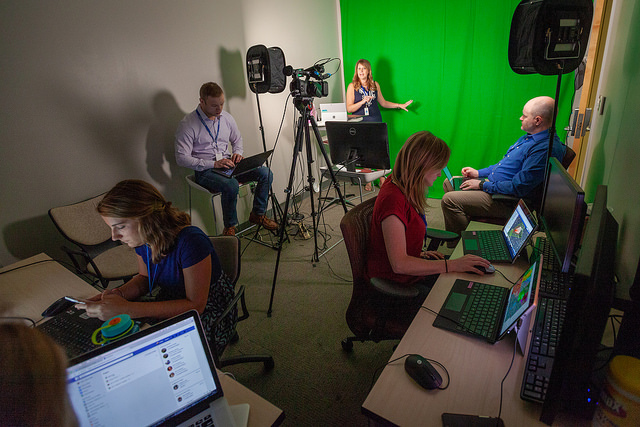 Broadcast meteorologist coverage decisions are researched and analyzed in the HWT, including social media decisions. 2016 National Weather Association Larry R. Johnson Award (Team Award): "For research, development and delivery of severe weather applications within the Multi-Radar, Multi-Sensor system, which has been successfully transitioned into NWS operations, providing critical tools for NWS forecast and warnings"